Szczecin boat, Poland. Located in 1962, 8 m long clinker-built, dated to early 9th century AD. Ref Ellmers: Frühmittelalterliche Handelsshiffahrt in Mittel- und Nordeuropa . The Ralswiek ships. Four clinker-built ships were found on land at Ralswiek on Rügen Island, Germany, during 1967-80. The ships have been dated to 9th-10th centuries AD. One of them has been reconstructed. The Hedeby ships. In the harbour of the old Viking town Hedeby (German Haithabu) in northern Germany, remains of at least 4 Viking age wrecks have been discovered, dated to 9th till 11th centuries. The salvaged parts are being conserved at the Haithabu Museum. Ref Skalk 3/80, French magazine Geo, April '99, and Ole Crumlin-Pedersen: Viking-Age Ship and Shipbuilding in Hedeby/Haithabu and Schleswig (1997). Link. Link. The Frauenburg finds. In 1895 and 1899 two ships were found in Frauenburg, present Frombork, Poland. 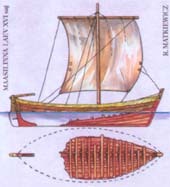 One was 17 m long and the other 6-7 m. They were clinker-built in Viking ship style. The remains were lost in WWII so they can only be dated roughly to 8th-11th centuries AD. Ref Ellmers: Frühmittelalterliche Handelsshiffahrt in Mittel- und Nordeuropa. The Boats of Danzig-Ohra. During dredging in 1933/34 three clinker-built boats, 11-13 m long, were found near present Gdansk, Poland. Investigated by Otto Lienau. Dated to 10th century AD. Ref Ellmers: Frühmittelalterliche Handelsshiffahrt in Mittel- und Nordeuropa. The Novgorod boats. In 1960 parts of three boats were found embedded in the wall on Novgorod, Russia. Apparently they were embedded during fortifications in 1044 AD. The best preserved boat consisted of crude planking and was ca 6.75 m long. Described by Vladimir Romanovich Chepelev in Skyllis 1/2001. Lebafelde boat. 14 m long clinker-built boat with one mast found in 1931 near Czarnowsko in present Poland. Investigated by Otto Lienau. Roughly dated to the second half of 11th c. Ref Ellmers: Frühmittelalterliche Handelsshiffahrt in Mittel- und Nordeuropa. Charbrow boat. Remains of this c 13 m long clinker-built boat was found in 1896 at Charbrowo in present Poland. Investigated by Hugo Lemcke. Dated to 11th-12th c. Ref Ellmers: Frühmittelalterliche Handelsshiffahrt in Mittel- und Nordeuropa. Danzig cog. Discovered intact in 1872/73 but was later destroyed. The Riga shipfinds. The most interesting find is the bottom part of a clinker built 12th - 14th c ship, discovered on 6 m depth in a filled-in river in the old port of Riga, Latvia. Excavated in 1939. Presumed to be a cog, but that has been questioned. The remains are displayed in the Municipal and Navigation Museum in Riga. Ref IJNA 20.4 1991 and Skyllis 1/2002. Darsser Cog, Rügen, Germany. Found in the 1970s. Loaded with brick and other goods from Norway. Dated to 2nd half of 13th century. Investigated in 2000 and 2001. Part of the EU project MoSS. Described in Nachrichtenblatt Arbeitskreis Unterwasserarchäologie 8/2001. Images. Gellen wreck. Shipside found off Rügen, clinker built, loaded with chalk stone from Öland, Sweden. dendro dated to early 14th century, possibly a cog. Has been documented as a photo mosaic, and completely raised, now being conserved. The construction is unusual with a carvel layer outside a clinker hull. Photos by Klaus Andrews, Hamburg. Pärnu cog. Parts of a 14th cent. cog found in Estonia in 1990. Being conserved by the Estonian Maritime Museum. Poel wreck, Wismar Bay, Germany. Found, investigated and recovered in 1999. 22 m long clinker-built hull section dendro dated to 1354. Ref Thomas Förster in Skyllis 1/2000. Copper wreck. Merchant ship from ca 1390-1430 loaded with copper. Excavated 1971-75 by the Polish Maritime Museum. The Wreck in Wismar-Wendorf, Germany. Found in 1998, later investigated and recovered. Consists of parts from keel and stem, sawn planks, from a ca 18 m long clinker-built ship dendro dated to 1476. Ref Thomas Förster i Skyllis 1/2000. The Danish-Lübeck fleet off Visby . In 1566 the fleet was anchored off Visby, Gotland, when a sudden storm sank at least 15 ships, killing thousands of sailors and soldiers. The wrecks have never been located. Maasilinn wreck. Off the large Estonian island Saaremaa, a shipwreck has been found, that is dated to about 1568. It was salvaged in 1987 and conserved with PEG by the Estonian Maritime Museum. The Swedish fleet off Domesnäs. In 1625 a Swedish fleet of 10 men of war sank in a storm off cape Domesnäs in the Riga bay in present Latvia. In 1936 a 2 m tall sculptured wooden lion was washed ashore, maybe from the ships. The wrecks however, have never been found. Solen. Swedish 20-gun battleship. In battle off Danzig in 1627, was blown up by its crew to avoid surrender. Excavated by Polish archaeologists in the 1970s. Only the bottom remains. Ghost ship. Intact 25 m long flute ship on 125 m depth in the Baltic Sea. Located in 2006. Link. Mynden (Arkona Wreck). In 1991 a carvel-built wreck was found by German Navy divers on 10-12 m depth c 800 m off Cape Arkona on Rügen. Investigated by Thomas Förster from 1992. One bronze and three iron guns were found. The ship may have been an armed merchantman or a small warship, probably the Danish frigate Mynden. A wood sample has been dendro dated to 1718, which is the earliest possible year of sinking. One more object has been recovered with the year 1718 stamped. Ref Nachrichtenblatt Arbeitskreis Unterwasserarchäologie 5/99, and 9/02. General Carleton of Whitby. British ship sunk in 1785, off the Polish coast. The Viborg Bay battle and the Svensksund battle, Swedish and Russian wrecks from two battles in 1790. One site is in Russian waters and the other site is in Finnish waters. Riksens Ständer. Swedish battleship sunk off Tallinn, Estonia, in 1790. The wreck was discovered in 1897. A gun and an anchor were salvaged, which are still on display in central Tallinn. During a 1998 investigation minor objects were salvaged from the wrecksite. The actual wreck is totally destroyed because of its location in shallow water . Deep Baltic mystery ship. Discovered on deep water in 2002, masts standing, maybe mid-18th century. Some years have now past since this unique and mysterious find, and no investigation is planned. If nothing is done soon, this ship may well be wiped out by one of the many trawler fishers of the Baltic Sea. The Chalk wreck. In 1991 a sailing ship with a load of chalk was found in 30 m depth off Rostock, Germany. Undated, but probably sunken during the 19th century. Documented in 1992, '93 and '96. The stern seems to be destroyed by a WWII depth charge – perhaps the wreck was mistaken for a submarine – but the rest is well preserved. Ref M-J Springmann: Fundort Ostsee (2000). Russalka. Russian warship that sank in storm off the Estonian coast in 1893. The ship was built in 1868 as an ironclad gunship. The disaster killed 177 sailors and a beautiful memorial is still standing in Tallinn. The wreck was located in 2003 on 75 m depth by the Estonian Maritime Museum. Ref Associated Press, 27 July 2003 . Gangut. Russian warship sunk in the Finnish bay in 1897, located in 1988. Photo. Yenisey, Russian warship sunk by a torpedo in 1915, Estonia. Investigated by the Estonian Maritime Museum. Mine sweeper 1, ex Linnea. Previous passenger steamer that was converted to minesweeper by the Russian navy. Sunk in 1916 by a mine off Vormsi, Estonia. A very well preserved 47 mm gun was salvaged in 1997 and is on display at the Estonian Maritime Museum. Bars. Russian submarine lost in 1917 in the Baltic Sea. Located intact in 1993 on 127 m depth by Swedish ROV. Hansa. Swedish passenger ship torpedoed by Soviet sub L21 in 1944. Only two survived. Located by Bengt Grisell in 1988 on 100 m depth and photographed with an ROV. 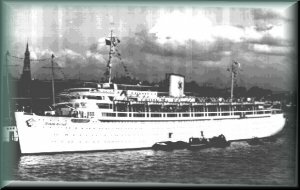 Wilhelm Gustloff. 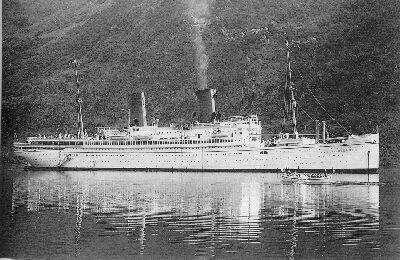 German 208 m long passenger ship built in 1937-38 and named after a Nazi "martyr" who was killed in Switzerland. She was built for 1463 passengers and 650 crew. During just one year she served as a cruise ship offering subsidised vacation tours for workers, through the "Kraft durch Freude" organization. But then came the war. On January 30, 1945 she went from Danzig with civilian refugees and wounded soldiers trying to escape the Red Army. Nobody knows how many were onboard, perhaps 10 000. During the night she was hit off the present Polish coast by 3 torpedoes from Soviet submarine S-13, under Commander Alexander Marinesko. Hundreds died instantly, and after one hour the ship sank. About 1250 survived, and around 7-9000 died in the ice cold water, making this the worst maritime disaster ever. The wreck is on 50 m depth on Polish territory. Russian divers have dived on the wreck after WWII. Polish official divers have dived and documented the site repeatedly since 1973. The wreck is now considered a grave, guarded by Polish Coast Guard and diving is not permitted to the public. The bow and stern are well preserved, but the middle section was demolished after the war. The midships section is so damaged that any hopes to find the famous Amber room inside, seem to be wishful thinking or empty rumours. Described in Die Gustloff-Katastrophe by Heinz Schön. General von Steuben. German passenger ship built in 1923, loaded with c 2000 wounded soldiers, 350 doctors and nurses, and c 1000 refugees. Departed from Pillau, trying to escape the Red Army. Sunk off East Prussia, 10 February 1945, by Soviet sub S 13, under Commander Alexander Marinesko. She was hit by 2 torpedoes and sank in just 7 minutes. Ca 300 survived. Described in Havsvargar by Per-Olof Ekman. Goya. Norwegian cargo ship built in 1942 and taken to German service. 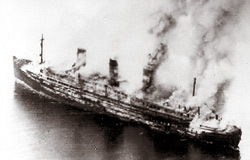 On 16 April 1945, she was loaded with German soldiers and civilian refugees from Danzig. Sunk, presumably by Soviet submarine L-3 under under Commander Konovalov. The ship broke in two and sank in just 4 minutes. Ca 170 survived and maybe 7000 died. The wreck was located on 80 m depth on Polish water in 2002 by Polish diver Grzegorz Dominik, and documented in 2003 by a film team from the German TV station MDR. After the 2003 expedition, the wreck was considered a grave, and diving was simply prohibited. Described in Havsvargar by Per-Olof Ekman. Photo. Cap Arcona and Thielbek. These two German passenger ships were in the Bay of Lübeck, loaded with ca 7800 evacuated prisoners from concentration camp Neuengamme. On 3 May 1945 they were by mistake attacked by the RAF. A few hundred survived the burning hell. The burnt ships lay on shallow water and were later removed, so they are not wrecks anymore. Thus, these two ships do not belong to underwater archaeology, but are mentioned in this context. Described in Dödens hav – Östersjön by Claes-Göran Wetterholm. Conclusion: These four Baltic Sea disasters of 1945, killing ca 25,000, may be the worst in world history. Graf Zeppelin. German aircraft carrier, captured in 1945 and scuttled off the Polish coast in 1947. Discovered in 2006. Link. Link. "Swedish DC3". Swedish Air Force C-47 plane (Swedish designation "Tp79"), shot down over the Baltic Sea in June 1952. This was part of an international incident, the "Catalina Affair". In 2003 the wreck was located with side scan sonar on 120 m depth, and lifted by Swedish Navy in 2004. Jan Heweliusz, Polish ferry built in Norway in 1977, sunk in the south Baltic Sea in 1993 on 26 m depth. 54 people died. No archaeological significance, now a popular diving object. Estonia. Estonian Passenger ship that sank in 1994 on international water in the middle of the Baltic Sea on its way from Tallinn to Stockholm. No archaeological significance, just tragedy. Nearly 900 people died.